Dartmouth Dining Services employs unionized and temporary workers. Excluding faculty and student employees, Dartmouth currently employs 1,340 individuals on hourly wages. Of these employees, the average hourly wage sits at $22.67, with no employees currently making minimum wage. The livable wage calculator created by Amy Glasmeier at the Massachusetts Institute of Technology estimates a livable wage for a full-time hourly employee in New Hampshire at $12.29 an hour. According to statistics provided by Scot Bemis, the College’s chief human resource officer, Dartmouth is currently employing 17 people below this livable threshold. This means that a small subset — only around 1.3 percent — of Dartmouth’s employees are being paid below estimates for a livable wage in the area. Chris Peck, president of the Local 560 branch of the SEIU, which operates on campus, said that unionized Dartmouth employees are “well compensated.” Salaries for SEIU member employees in Dartmouth’s dining areas start at $16.67 an hour with a guaranteed two dollar raise after two years of employment. Peck attributes these wages to years of contract negotiating through the SEIU. However, Peck also noted that “as time goes on, everybody gets fancy about how they avoid the contract.” For example, Peck cited Dartmouth’s use of temporary employees as the latest example of this. DDS currently employs 184 non-student employees in addition to its 46 additional temporary employees, a number which frequently changes. These temporary employees do not work during winter or spring breaks, finals week, nor do they during the summer term or receive benefits from the College like regular employees do. Temporary employees are hired both through agencies and on an individual basis, according to DDS director Jon Plodzik. 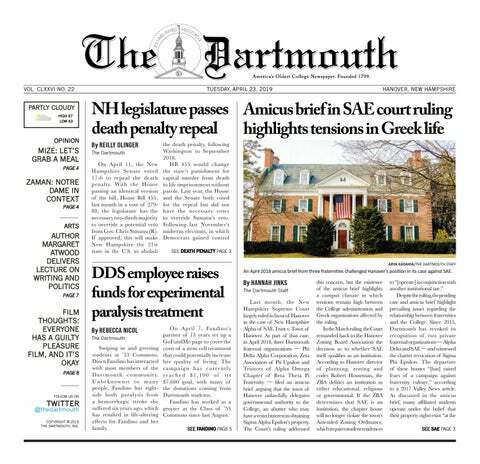 While Dartmouth’s contract with the SEIU allows for the use of temporary employees, there are constant battles between the College and the union as to how many temporary and full-time employees the College employs, Peck said. He added that Dartmouth’s use of temporary employees has been increasing in recent years. Plodzik said he viewed the College’s use of temporary employees as beneficial to both DDS and employees. DDS has a significant need for temporary employees to fill gaps left by sick or otherwise absent employees in addition to other critical roles which may not constitute full time jobs, he said. Administrative human resources services manager Kelly Mousley agreed, saying that temporary employees also benefit from flexible, yet consistent, work schedules. “The temporary employees really enjoy being on campus,” she said. Additionally, Plodzik said the use of temporary employees is a “nice pipeline” that allows workers to get a feel for the job and for DDS to get to know employees before hiring them full-time. While the use of temporary employees may have certain benefits for workers, the temporary employees’ pay is substantially lower than their unionized co-workers’. Peck said that temporary employees are often paid around $13 an hour, about $3.67 below the union rate and about 71 cents above the estimate for a livable wage in New Hampshire. Temporary employment agencies are often paid $20 an hour for temporary employees with only $13 of this money making it to the employee, Peck said. He said that Dartmouth is paying six dollars an hour to an outside company to manage their employees. Peck added that, as a college with a $5.5 billion endowment, Dartmouth has a duty to be a responsible employer and pay all of its employees a fair and livable wage. Additionally, temporary employees, without the protection of a union contract, can be terminated at any time. If they go on to become full-time employees, they must go through the 90-day probation period for all new employees, even if they have been working for DDS as a temporary employee for up to six months, Peck said. SEIU membership among Dartmouth’s employees has decreased by around 40 members over the last decade, according to Peck. This decrease comes as the College has expanded and opened new facilities, possibly the result of the increased use of temporary workers to meet new staffing needs. Overall, Peck said that Dartmouth is “pretty fair” when it comes to compensating employees, but that this fairness is a result of long-term union work. “We keep them fair,” he said.